This is a mill wheel that is part of a marble run set. 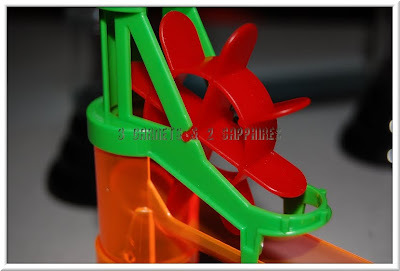 One of the fun parts of this toy is to figure out where to put the two mill wheels so that the marbles will hit them just right to make them really spin fast. One of these days, I'll have to figure out which camera setting will allow me to catch the motion. The wheel was actually spinning here, but my camera captures it as being still.